A short clip of a typical street scene in China. This one is in the culturally-rich city of 绍兴Shaoxing in 浙江Zhejiang province. Although I taped it from one perspective, it shows the confluence of many activities that is characteristic of China. A Boatman doing repairs on his boat on the famous lake in 绍兴市Shaoxing city, while live classic regional music plays in the background. The hotel room I used in Shanghai City in 2004. It was a decent room, costing me about Y120 or so, which was quite cheap (on average it was an expensive room for me, but this is Shanghai) consider that it was within the city and a walking distance to the 外滩Waitan (the Bund). Other than having a window view of the streets below, the room has nothing distinctive — the same ubiquous chair and tray of a thermo and tea cups, and the colorless and alienated TV. But on the second day, I woke up and felt a slight wind blowing. The silent air was puffing the long red curtains, reflecting the now very warm glorious morning light down onto the patterned arm chair and wallpapered wall. The single soundless moving curtain in a still room trapped my thoughts at the moment. Like in a theather this red curtain opens to a bonfire world — diametrically opposite this seemingly uptopian interior. When you travel as art and when you travel for a longer period of time — time and distance, land and space, and movement become metaphors of significance. As such, common and insignificant things as in this video clip often become momentary flashbacks and reflections of one's self. I did this short video clip of 上海市Shanghai's large Railway Station — both its outside square and one of its inside waiting area. The outside square, like all large squares of China's big stations, are packed with people: some are waiting to get in, while others spent their nights here; many are migrant workers. It was Autumn 2004, and I was heading toward 绍兴市Shaoxing City at the time. When I am very conscious of an area, I usually stick around to do some odd works. These I sometimes consider as art pieces. On this page are some art video works I did. 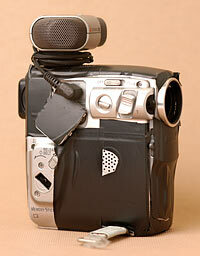 Above is the Sony 109 miniDV video camera attached with a Sony ECM-S930C microphone. This is the machine that I used for the videos.